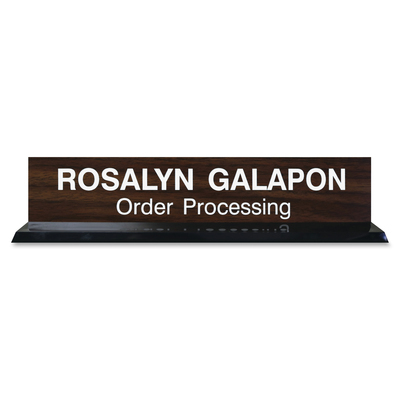 Desk Sign With Square Corners Can Show Off Your Name Or Significant Message On Countertops And Office Desks In Office, Courthouses, Schools And Warehouses. It Comes Complete With A Sign And Black Frame Base. Customize The 2" X 10" Sign With Your Choice Of More Than 35 Typestyles And 20 Varieties Of Plate Colors. Plate Can Be Replaced And Is Made Of High-Grade, Durable Plastic.. Desk Sign With Square Corners Can Show Off Your Name Or Significant Message On Countertops And Office Desks In Office, Courthouses, Schools And Warehouses. It Comes Complete With A Sign And Black Frame Base. Customize The 2" X 10" Sign With Your Choice Of More Than 35 Typestyles And 20 Varieties Of Plate Colors. Plate Can Be Replaced And Is Made Of High-Grade, Durable Plastic.